Primary school swimming lessons Sydney. Learn to swim. The Moving Bodies swimming program is unique to our company. 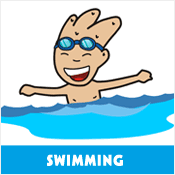 As with all our programs, the swimming lessons are structured to suit the abilities of each student. Our lessons are designed to cover every aspect of swimming from water confidence & survival skills through to stroke correction. Our instructors have gained professional coaching experience from schools and private swimming institutions. The Moving Bodies unique style of instruction ensures the children learn to swim confidently while enjoying the experience of being in the water.